With all of the rushing around and delays you come across while traveling, having some snacks on hand helps keep everyone well fed and avoid meltdowns. I always pack snacks in advance, just in case we don’t have a moment to stock up at a café or shop at the airport – or if we find ourselves stuck somewhere without food. Some foods I usually pack are: dried fruit, rice cakes, cereal, bananas, apples, crackers and pretzels. I also pack a refillable water bottle for Little T (as well as one for myself). I try to always have some water for him to drink on our way to the airport then I empty the bottle before security and refill again before heading to our gate. Heathrow, for example, has water fountains throughout its terminals where you can fill up your water bottle. Spills and mess happen – and wet wipes are so helpful to keep clean on the go! I always have at least one pack, and start the flight giving the tray tables and armrests a good wipe down. I also pack plastic bags to store away any used wipes and other rubbish to be disposed of at the end of the flight. And since Little T is usually running his hands all over everything at the airport or on the airplane – I keep the hand sanitizer somewhere easy to find and use it frequently. To be honest, I squeeze in as many extra clothes as I can for Little T, but it’s at least two sets of clothes for short haul and three sets for long haul plus some extra socks since he doesn’t wear shoes while we’re at our seats. The temperature on the flight can vary from sweltering hot to absolutely freezing, so I dress him up in layers, i.e. a cardigan or sweater, t-shirt and vest, and to keep comfortable, a pair of sweatpants. I also pack at least an extra top for me to change into just in case, along with a plastic bag to store away dirty clothing. Having some entertainment prepared for your journey will help immensely. What works for us are activity books, travel games and simple arts and crafts, so plenty of coloring, stickers and using child-safe scissors for cutting practice or glue to make collages. I usually pack activity books, small cars and toys, crayons, scissors and glue, and sometimes Little T picks up a kid’s magazine at the airport. CBeebies Art is a good one for travel and comes with a packet of craft supplies. We also have a Kindle Fire HDX 7″ that I update before each trip with age-appropriate e-books and apps. Favorite app series include Dr. Panda, Sago Mini and Monkey Preschool. We have access to Amazon Prime for free TV shows and movies so I download a couple new ones especially for long haul flights. I pack a Baby Aid Compact kit that I check ahead of time so it’s well stocked for our holiday. It’s very small and easy to carry and packed with first aid essentials, including burn gel, plasters, first aid scissors, bandages, sterile eyewash, non alcohol wipes and disposable thermometers. Other items include Calpol/child’s paracetamol sachets, teething granules packets, nasal spray, ibuprofen or paracetamol for me, nappy cream and Lucas Paw Paw multi-purpose ointment for chapped lips or to heal cuts. I hope you found this list helpful. 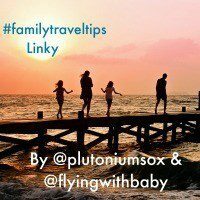 Stay tuned for more of our tips on Flying with Kids! 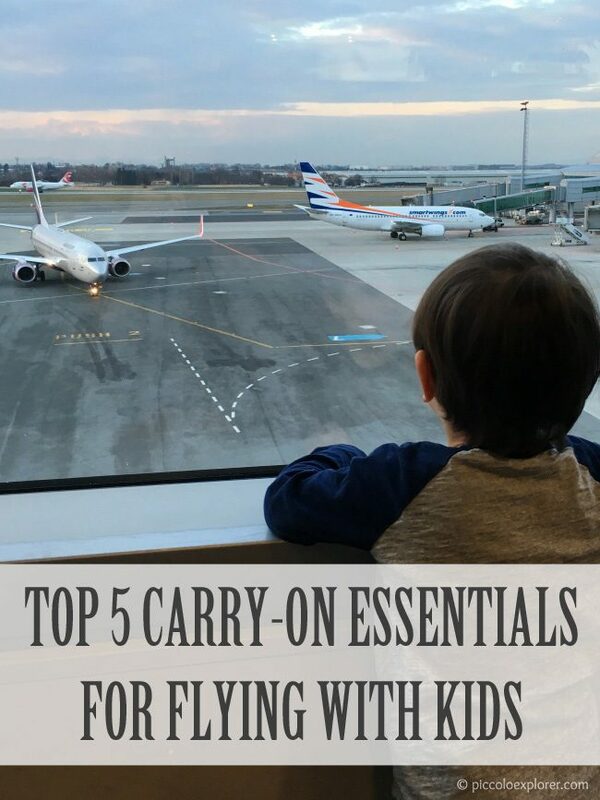 And I’d love to hear from you – please let me know in the comments: What are your carry-on essentials and must-haves for traveling with kids? First aid kit!!! I ALWAYS need bandaids. Great tips! !